Portraits of the Beatles, beautifully inscrutable abstract canvases, Pop Art soup cans, Che Guevara posters, photos of anti-Vietnam protests and Aldermaston marches (I couldn't spot EP Thompson! ), 'self-destructing poems' by Bob Cobbing: the Auckland Art Gallery's Art and the 60s exhibition has something for everybody, which makes it difficult to describe in five minutes. 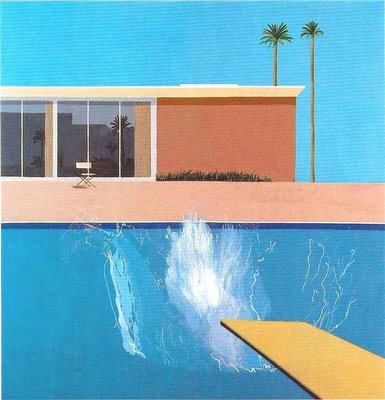 I'll stick to remembering my surprise at entering one of the gallery rooms finding myself suddenly in the presence of David Hockney's painting A Bigger Splash, which I seem to have seen a thousand times in art textbooks and on posters. Surprise soon gave way to a strange sort of disappointment, however: Hockney's canvas seemed somehow less lustrous 'in the flesh' than it had on glossy pages. Perhaps it's one of those rare artworks that looks better in reproduction than on the wall. Go and have a look for yourself and let me know what you think. Even if Hockney disappoints there'll be plenty of other stuff that takes your fancy. Be warned, though: the bastards will make you pay through the nose ($12, $10 concessions) to get through the door.